Total freshwater and saline-water withdrawals in the United States for 2000 were estimated to be 408 billion gallons per day, or 457,000 thousand acre-feet per year. The largest water withdrawals were for thermoelectric power and irrigation. See the USGS 50 Years of Water Use Information site for total water withdrawals by category and state, and for additional information on national water use. California has always reported the largest total fresh and saline withdrawals of all states in the Nation (USGS), primarily because we have the largest population of any state and a thriving agricultural industry. California's estimated water use for 2000 was 51,200 million gallons per day, of which 38,400 million gallons was freshwater (USGS). 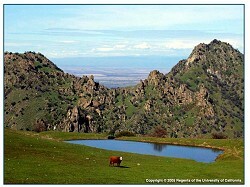 The Department of Water Resources (DWR) California Land & Water Use is a collection of vital information related to the water used in various human activities. It covers urban, agricultural, and managed wetlands water use, known collectively as cultural water use. These data are critical to water resources planning studies, evaluation of water use efficiency measures and other water management options, and for estimating future water use in California. California's per-capita use for total off-streem freshwater withdrawls in 1995 was 1,130 gallons per day, which ranked below the national average of 1,280 gallons per day (USGS). You can calculate the total volume of fresh water that is used to produce the foods and services consumed by you or your business by visiting the Water Footprint website maintained by UNESCO-IHE Institute for Water Education in collaboration with the University of Twente, the Netherlands. DWR's Water Conditions in California has forecasts of the volume of seasonal runoff from major watersheds and summaries of precipitation, snowpack, reservoir storage and runoff for various regions of the state. DWR's Current Water Supply Conditions displays current percentage of average capacity at major California reservoirs. NRCS water supply forecast reviews streamflow, snowpack and reservoir storage for the Western United States. 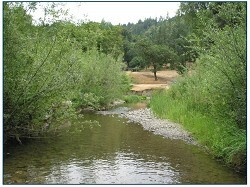 The California Irrigation Management Information System, which manages a network of over 120 automated weather stations in California, was developed by the California Department of Water Resource and the University of California at Davis to assist California's irrigators in managing their water resources efficiently. The National Sustainable Agriculture Information Service (ATTRA)'s Measuring and Conserving Irrigation Water describes how to find the net water application rate for any irrigation system, how to calculate the number of hours the system should operate, how to measure flowing water in a channel or pipeline and how to irrigate with limited water supplies. 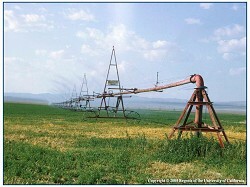 They have also published a useful guide to Energy Saving Tips for Irrigators. DWR's Office of Water Use Efficiency Drainage Reuse Report includes information on the reuse of irrigation water, while their Source Reduction Report discusses reducing the amount of subsurface drainage water from a field through water conservation for salinity management. Additional Water Recycling and Desalination Publications can be found on their website. The National Academy of Sciences' book Use of Reclaimed Water and Sludge in Food Crop Production, available for purchase on their website, reviews the practice of reclaiming treated municipal wastewater for agricultural irrigation and using sewage sludge as a soil amendment and fertilizer. 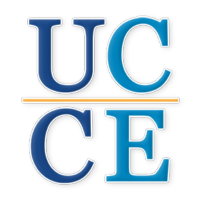 UC Davis Department of Land, Air & Water Resources (LAWR) provides Californians with continuing education and scientific research and advice in addresssing agricultural, natural resource and environmental quality issues as they pertain to water, soils and the atmosphere. DWR's Office of Water Use Efficiency works to disseminate and transfer information on improved irrigation technologies and to identify and help develop technologies and farming methods that improve water use efficiency. NRCS Water Management Center provides leadership, direct assistance, information, and technology on water-related issues for natural resources conservation. The Agricultural Water Management Council is a non-profit organization dedicated to bringing together all interested parties in agricultural water management with the expressed goal to achieve greater water management efficiency. The WateReuse Foundation is a non-profit public benefit corporation that serves as a centralized organization for the water and wastewater community to advance the science of water reuse, recycling, reclamation, and desalination.